Scientists at the Laboratory of Organic Electronics have developed an ultra-sensitive heat sensor that is flexible, transparent and printable. The results have potential for a wide range of applications - from wound healing and electronic skin to smart buildings. 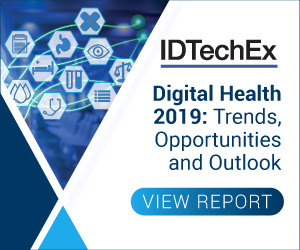 For more information see the IDTechEx report on Flexible, Printed and Organic Electronics 2019-2029. The ultra-sensitive heat sensor is based on the fact that certain materials are thermoelectric. The electrons in a thermoelectric material move from the cold side to the warm side when a temperature difference arises between the two sides, and a voltage difference arises. In this present project, however, the researchers have developed a thermoelectric material that uses ions as charge carriers instead of electrons, and the effect is a hundred times larger. A thermoelectric material that uses electrons can develop 100 μV/K (microvolt per Kelvin), which is to be compared with 10 mV/K from the new material. The signal is thus 100 times stronger, and a small temperature difference gives a strong signal. The results from the research, carried out by scientists at the Laboratory of Organic Electronics at Linköping University, Chalmers University of Technology, Stuttgart Media University and the University of Kentucky, have been published in Nature Communications. Dan Zhao, research fellow at Linköping University and one of three principal authors of the article, has discovered the new material, an electrolyte that consists of a gel of several ionic polymers. Some of the components are polymers of p-type, in which positively charged ions carry the current. Such polymers are well-known from previous work. However, she has also found a highly conductive polymer gel of n-type, in which negatively charged ions carry the current. Very few such materials have been available until now. With the aid of previous results from work with electrolytes for printed electronics, the researchers have now developed the first printed thermoelectric module in the world to use ions as charge carriers. The module consists of linked n- and p-legs, where the number of leg connections determines how strong a signal is produced. The scientists have used screen printing to manufacture a highly sensitive heat sensor, based on the different and complementary polymers. The heat sensor has the ability that convert a tiny temperature difference to a strong signal: a module with 36 connected legs gives 0.333 V for a temperature difference of 1 K.
"The material is transparent, soft and flexible and can be used in a highly sensitive product that can be printed and in this way used on large surfaces. Applications are found within wound healing, where a bandage that shows the progress of the healing process is used, and for electronic skin", says Dan Zhao. For more information see the IDTechEx report on Advanced Wound Care Technologies 2018-2028. Another possible application is in temperature exchange in smart buildings.